Candy companies finally nailed a reliable, factory-producible chewing gum recipe in 1928. That, combined with the growing, gnawing Great Depression, opened the door for two sea changes in baseball collecting. Bigger cards: gum worked better in thin sheets and proved easier to package than cube-like candies. 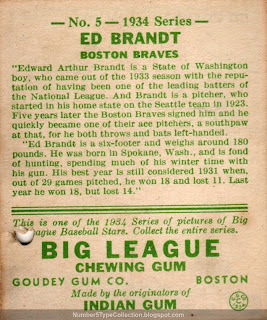 Large squares of gum encouraged larger, squarish baseball cards. Marketing to kids: children didn't get much respect in the early 20th century, but growing city populations made them both more visible and created money-making opportunities. Gum cost so little, companies could sell it and full-color cards for pennies. For the record, a packaged 1934 Goudey card and gum cost one cent. The blue Lou Gehrig banner decorates 2 sections of the 1934 set, cards #1 - 79 and 92 - 96. A red banner featuring hitting champ Chuck Klein appears on #80 - 91. 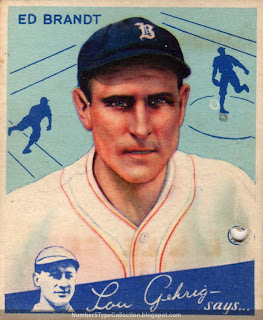 I've read that Gehrig disputed his likeness appearing on every card and Goudey redesigned a portion of the high-numbered printing sheets pending a new endorsement deal, which apparently worked out. 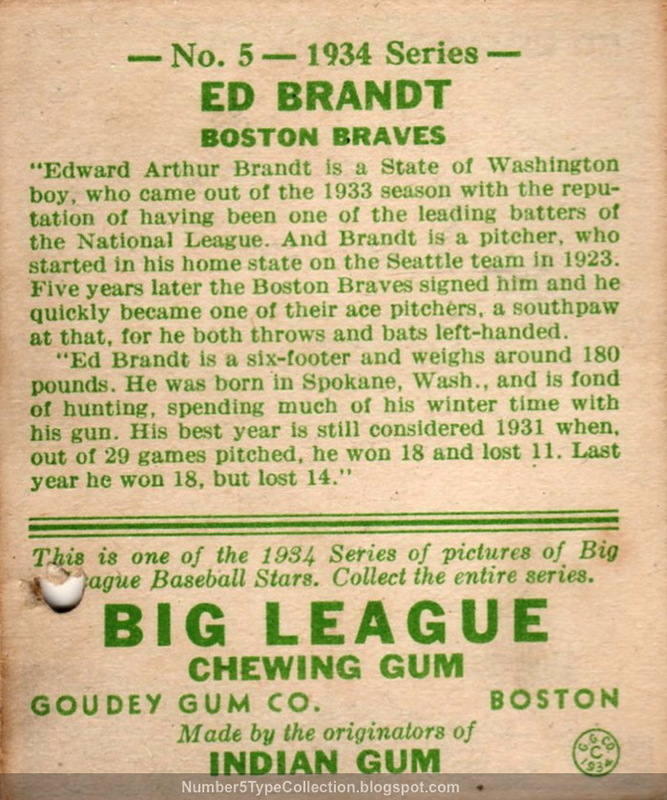 Ed Brandt, native of Spokane, WA, played a total of 11 seasons for Boston, Brooklyn, and Pittsburgh. I can't help but notice he's yet another 6', 180-pound player. It's a common enough size today--that's basically me--but probably seemed strapping in 1934. Value: Mr. Brandt cost $10 at a 2005 Philly Show and is a nice card, apart from the hole punch. The very rare high numbers routinely go for $100 and up. Fakes / reprints: I've seen multiple 1934 Goudey reprints, both of star players and the entire set. Watch for "reprint" on the back or spots of missing paper near the "Goudey Gum Co." or "Boston" text on the back, where that word would be.